Gather the pieces. Let nothing be wasted. The first post in our series on food waste by Tearfund. The morning after the general election, I found myself bleary-eyed in an underground car park with my colleagues Jack and Antony, peering into a car boot stuffed to the brim with bread. Already running late, we were trying to work out how we could possibly carry nearly 40 loaves between the three of us. We had an impressive haul of goodness – Hovis, Kingsmill, wholemeal, toasting bread, you name it – and soon they were being crammed into an assortment of backpacks, jute bags, and supermarket wire baskets. We looked a strange sight as we hurried through the streets, and certainly attracted attention when we finally placed our load down at our destination: St Paul’s Cathedral. There was method in our doughy madness. All the lovely bread we were carrying was perfectly good to eat – but was waste bread, at risk of being binned. We were here to kick off Tearfund’s new campaign on food waste – Renew Our Food – by raising awareness about just how much of our daily bread we’re not eating. St Paul’s is one of the UK’s largest cathedrals and each month we waste enough bread to fill this magnificent building to the brim. That’s 48 million loaves of bread. Each month. Totally edible food, totally preventable waste. When it comes to food waste though, bread is just the tip of a larger waste mountain. One third of food grown in the world is never eaten. One third. When so many people are going hungry, surely this is a completely nuts (yes, pun intended) state of affairs? No-one sets out to waste food. It’s just that we buy too much, or we cook more than is needed. We’ve all been there – tempted in by a BOGOF deal, suddenly finding ourselves eating out twice in a week or discovering a couple of carrots (or five) mouldering away at the back of the fridge. And it’s not just consumers. Supermarkets recognise they could be doing more too. Tearfund’s Renew Our Food pledge calls on them to publish a plan to halve their food waste by 2030. This would include taking action on so-called ‘wonky veg’, relaxing the overly-strict cosmetic standards that lead to a third of all vegetable crops never even making it to our stores. 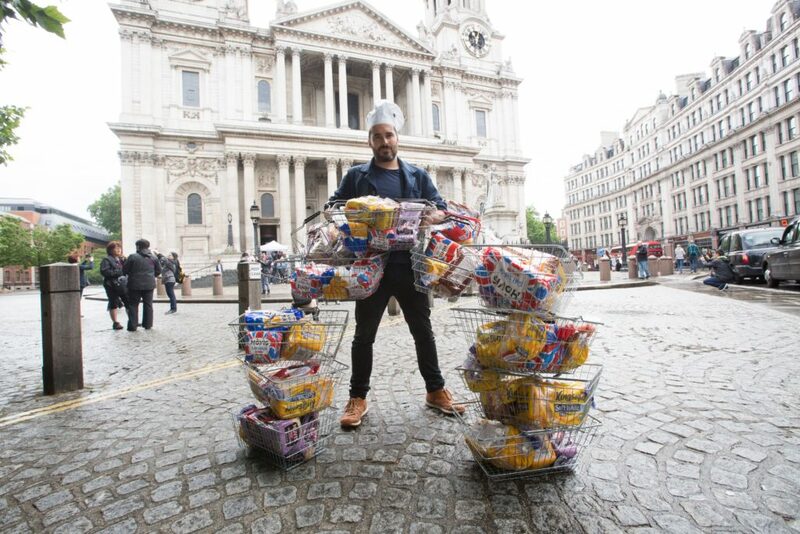 Outside St Paul’s, we arranged our loaves into 12 wire baskets for a photo shoot with Bishop of Islington, Ric Thorpe, and TV baker, Tom Herbert. Looking down at our little baskets against this mighty backdrop, they suddenly felt ridiculous – a drop in a bready ocean. Bishop Ric and Tom Herbert pose outside St Paul’s cathedral with 12 loaves of waste bread. I remembered a verse that had jumped out at me back in September. A familiar story – the feeding of the 5,000 – but this time my attention had been drawn to something new. After Jesus had fed everyone miraculously with the five loaves and two fish, he gave a very specific instruction. It was this: “Gather the pieces. Let nothing be wasted” (John 6:12). Why did Jesus care about the leftovers? He had provided abundantly, yet he cared that none of it was wasted. The disciples did as he commanded – and what was gathered up was more than they had started with – 12 baskets of leftovers in total. Food waste is a hot topic right now, but how many people are aware of the link between what we throw away and the world’s poorest people? Food waste fuels climate change – and UK household food waste generates 20 million tonnes of greenhouse gas a year. This makes life harder for people in poorer countries because more greenhouse gas means more climate change, which means more droughts, floods and less reliable rain. Cutting down on our food waste is one of the easiest ways we can take action on climate change – and it has a real impact, the equivalent of taking one in every four cars off our roads. Imagine the possibilities if supermarkets took more ambitious action too. We can do this, but we’ll only do it if we do it together. Bishops and bakers, supermarkets and students, churches and chefs and everyone in between. So, let’s do this. Gather up the pieces. Let nothing be wasted. By taking the Renew Our World pledge today, you can pledge to reduce your food waste at home, and call on your supermarket to do the same. Visit www.tearfund.org/foodwaste to take action and find out more. Images by Clive Mear for Tearfund. Clare Lyons is a campaigner and works for Tearfund. She loves seeing signs of God’s kingdom come through our small and big actions to change the world. A qualified nutritionist, she's passionate about food, community, sustainability and spreading the vegan love. Often found singing, getting over-excited and showing off her range of explosive laughs.